If you have never heard of ISH Fair/Salon taking place every other year in Frankfurt, Germany and you love Interiors, I cannot blame you. I had never heard of that salon before I worked for a Luxury Bathroom Brand, yet I remember the employees talking about it as the most sacred industry event requiring years-long planning. I was curious and thrilled when I got the opportunity to see for myself and visit as part of the exhibition team at the ISH 2017, and indeed it is HUGE, and the perfect place to spot the best of the International Bathroom industry, perhaps more focus to a professional distribution/reseller network audience. It was, to be honest, a little too much for me and I had to take some days off after the event as it was truly exhausting. So this year, I didn’t visit the show, but I have compiled fresh and unique information from my favourite luxury brands and made a list below. But why should that be of interest to you, you may ask? Well, all the top manufacturers take the opportunity to network but also to launch new product lines or test some product concepts to their professional reseller audience. This means this show can reveal upcoming Interior trends. I mixed a few items bathtub, washbasin, vanity, furniture, brassware, etc. and to be honest this is just my own selection from the show! Note: I may update this post with new pictures as the show just took place last week, some material has not been fully released yet. New Steel Collection between tradition and modernity. The german company specialised in high-end brassware has announced a new collection: New META series, available in 9 finishes and 3 design variants. 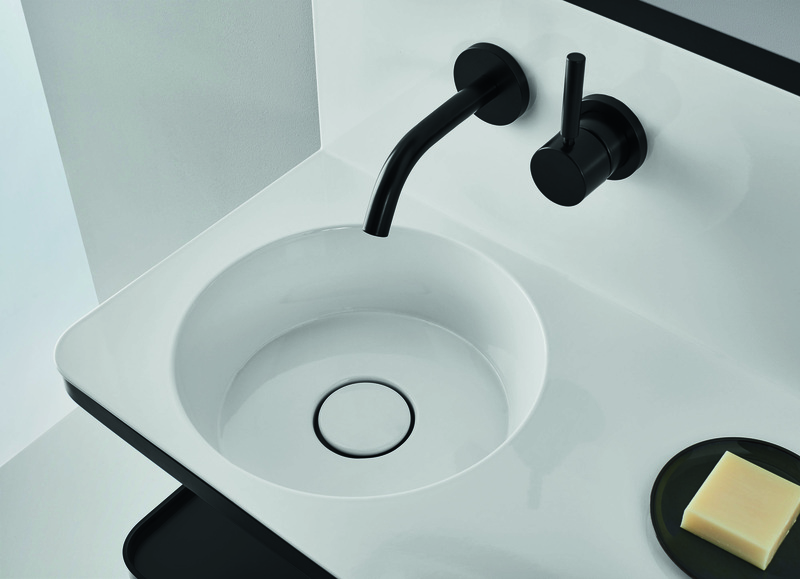 An elegant and minimalist design choice for bathroom design or kitchen sink tap. Meta Slim in yellow finish – mixed with chrome shower fixture for balance. Coated glass, fibrous material and elegant lighting create the opposite extreme to stern concrete. Vasco continues to expand its collection of electric radiators with the Oni and Beams Mono, Vasco introduces top design in electric heating. Electric heating works on the plug-and-play principle. This means there is no need for invasive drilling, channelling or maintenance work. These are announced available from summer 2019. Antheus Collection – 100 years of Bauhaus: Designer Christian Haas with a new take on classic forms. 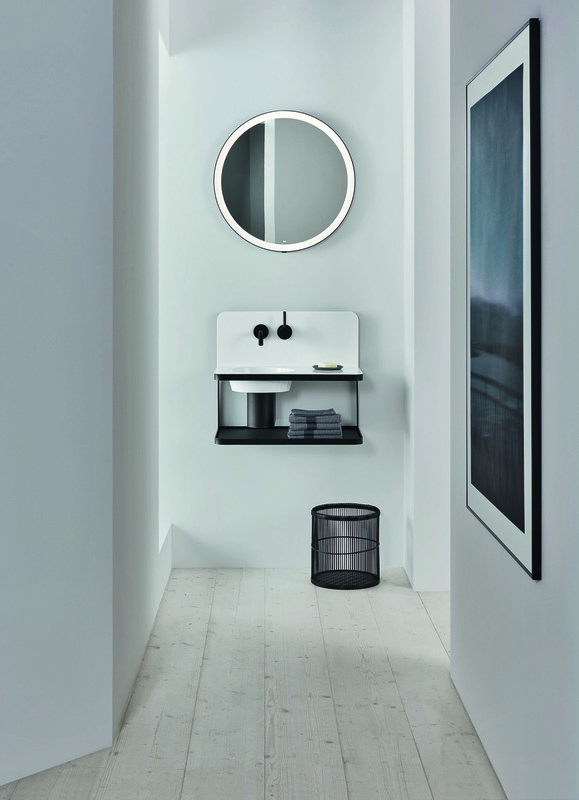 Villeroy & Boch celebrated the 100 years of Bauhaus by showing their recent collection called Antheus designed by Christian Haas. He mentions that one of the reasons why Bauhaus has still not lost its modern look is the systematic use of white. “White shows shapes in their full clarity without any distractions or sugarcoating. No other colour is as versatile and full of nuances, dependent on the lighting conditions.” says the designer. Finion Collection – New colours and combinations. 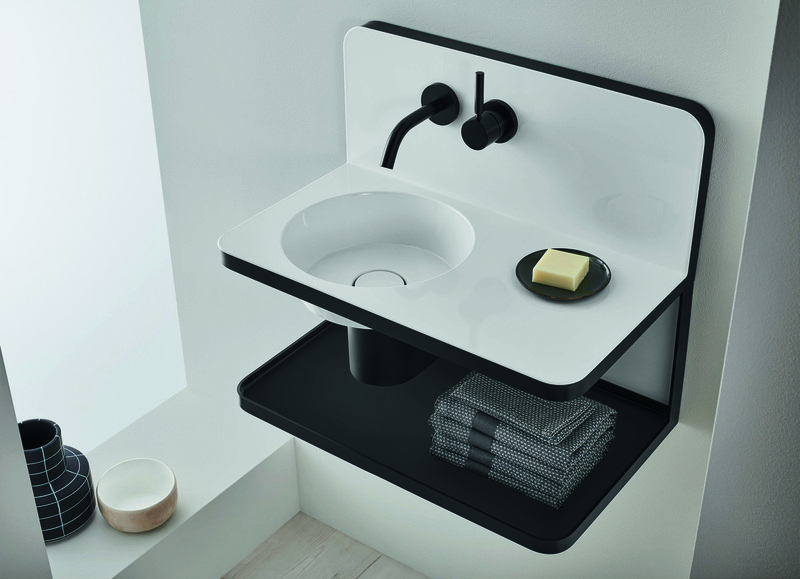 The Finion furniture range reflects the delicate design of the washbasins with edge and carcass thicknesses of just 8 mm. The colour concept for the Finion furniture range was developed by the German-Danish designer Gesa Hansen. One particular feature is the option of combining the colours for the front, carcass and shelves according to personal taste – for example a matt green shelf unit with a matt black interior. See below a few colour ideas. and this wraps up the article. I really enjoyed curating this article and hope you found some inspiration along the way. I am curious if people would be interested in round baths. What do you think? Comment down below. Personally, my little London home wouldn’t be suitable but if you live on the countryside, that could be an interesting choice. Hi Marlene, these bathrooms are simply stunning! It’s incredible how little details in each one really make a big difference. Thank you for sharing. I tell you what, haven't bathrooms come such a long way in the past few years? When I last renovated my bathroom about 5 years ago in the old house, everywhere bathrooms were the same. i'm about to embark on another bathroom reno, this time in the new house, and I am really excited that there is so much variety on the market. So much gorgeous bathroom inspiration here. I really love the pink terrazzo and matt black shower room. Thanks totally agree. That is a beautiful combo! Oh WOW there are some amazing new things on the horizon. I often think bathroom design isn’t as innovative as other areas of the home. This proves me wrong. I use to think the same as well! Typical boring white ceramics but actually there are some interesting things now.